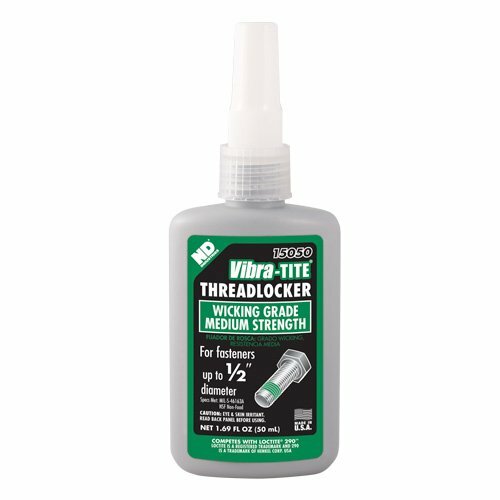 Vibra-TITE 150 Wicking Adhesive and Sealant is a fast cure, low viscosity anaerobic compound which enables the material to seek voids in assembled components and cure anaerobically (absence of air) on close fitting metal parts. Vibra-TITE 150 can be used as a post assembly application preventing loosening of metal threaded fasteners. Ensure parts are clean, dry and free from oil and grease before use. Product is normally hand applied from the bottle directly onto threaded parts. For porosity or hairline cracks in casting products, brush directly onto the parts. Fixture Speed without Primer is 10 minutes. Shelf Life is 12 months at 68 degree F. 24 hours at 68 degree F Full Cure Time. 20-100 inches/lbs Typical Breakaway Strength. 200-350 inches/lbs Typical Prevailing Strength. Product should be stored in a cool and dry location at temperatures between -10 degree C to 30 degree C. Optimal storage is 22 +/- 4 degree C. Shelf life is 18 months from date of manufacture when stored at 22 +/- 4 degree C. Designed specifically for use on pre-assembled fasteners up to 1/2'' in diamater and porous die castings. Protects welds from rust and corrosion. Hand tools are required for disassembly. 0.004 inches Maximum gap fill. 85/250 lbs Torque strength, Break/Prevail. 1.08 Specific gravity. N or T Suggested primer. 50 ml Bottle. If you have any questions about this product by Vibra-TITE, contact us by completing and submitting the form below. If you are looking for a specif part number, please include it with your message.